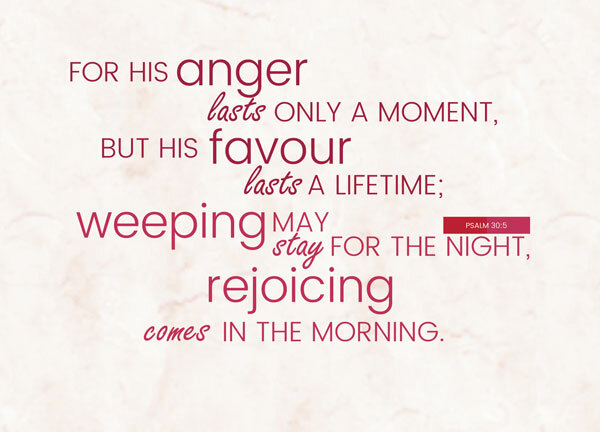 For his anger lasts only a moment, but his favour lasts a lifetime; weeping may stay for the night, but rejoicing comes in the morning. It has been a heartbreaking period of time for me personally, and things have happened that are difficult to endure. It came to a point where I was forced to re-examine myself and my life, and I found that my relationship with God has been lacking – I was falling into various kinds of sins. Perhaps small sins, if sins can be measured at all, but a prayer of confession and repentance led me to this verse. It has been a long time since I’ve worked on verses – perhaps this is as ever my spiritual compass, my daily manna, my bridge to God. Psalm 30 is a Psalm of David, for the dedication of a temple – this is not necessarily Solomon’s temple – in fact, it most likely isn’t. The Psalm talks about the typical cyclical relationship that most believers past and present have with our Lord – When times are good, and things are going well, we pride ourselves on it and tell ourselves, “I will never be shaken” [Psalm 30:6]. This leads us to become distant from God, and when we fall away from God, his discipline comes, and we fall into physical or emotional or spiritual ailments and suffering. We turn to God, crying out in repentance and petition. And God will never fail to deliver us. It is a common cycle, seen from the earliest days in the Garden of Eden, seen from our very own lives today, and perhaps Psalm 30:5 is David’s concluding thoughts about this. In today’s study, we will break the verse up into its four main phrases, and digest the message into encouragement and comfort for those whose are defeated and heartbroken. Holy anger – God’s anger, when compared to our own, humanly anger, makes a huge difference. It wouldn’t be exaggerating to say that humanly anger lasts a lifetime – or at least, an extended period of time. I’m sure we’ve all experienced that in our lives – it is difficult for us to get over what others have done unto us, it is hard to truly forgive, as God does – with no added conditions. No ‘I forgive you but I don’t ever want to see you again’. Thank God that when he rages, it lasts for only a short while. Imagine if God is forever angry with us (which he would be well in his rights to do)? What does God do when he is angry? In verse 7, it says that God hides his face. He chides us, reprimands us, turns away from us – but this happens for but just a short amount of time, and then he turns back to us in his everlasting love and compassion. Similarly, when we compare the favour of God versus the favour of Man, it’s again the opposite – the favour of God lasts a lifetime, the favour of Man lasts only a moment. What is God’s favour? His blessings, His life, and his love and grace. In Romans 8:38- 39 Paul proclaims that neither death nor life, nor angels nor rulers, nor things present nor things to come, nor powers, nor height nor depth, nor anything else in all creation, will be able to separate us from the love of God in Christ Jesus our Lord [Article]. His favour, unmerited favour, is simply everlasting, and it is a favour of a quantity, quality and duration that Man cannot ever offer. The prophet Hosea, when referring to Jacob, said this – Yes, he wrestled with the angel and prevailed; He wept and sought His favor. He found Him at Bethel And there He spoke with us [Hosea 12:4]. We often wrestle with God. We often weep. But let us not forget to seek God’s favour. Weeping in this verse is personified into a passerby, a lodger, who comes by and rests for just the night, and goes away. Isn’t this beautiful? Weeping may allude to suffering, or tribulations, or perhaps just referring to when God turns away from us, or when He is angry at us. You may be puzzled, as suffering rarely is so fleeting. Pain takes time to subside. While the ‘stay for the night’ imagery is probably not intended to be literal, but instead referring to a comparatively short time, that’s all. I wouldn’t be surprised if there are people who are capable to keep their sorrow to a night, if they draw strength from God and find their joy in His words. Then the man said, “Let me go, for it is daybreak.” [Genesis 32:26|Article]. This is a Psalm for the dedication of the temple, and on a personal basis, it is a dedication of myself from my sins of commission and omission in recent days. It was a particularly heartbreaking night yesterday, and I wept badly – I bawled. Things have escalated to a point where I realise that I cannot do it anymore, but turning back to God in repentance and solitude, I found myself led to this Psalm, to this verse, to a reminder that once my daylight comes, it is a brand new start. I started this day with a good jog, and with a comparatively light heart – I am not made of steel, so it’s not like I am particularly light-hearted at the moment, but yesterday’s sorrow is over. It is a brand new start, and for that, I rejoice. That I am able to do this study today, however lacking and however personal it may be, comes to me as a huge blessing and grace that I do not deserve. In recent years, it has been very difficult for me to write. I do not pretend that I am able to continue this on a daily basis, but I shall endeavour to seek God, and I know I will find him. I don’t know why you’re reading this – reVer(sing) Verses is really just a selfish pet project of mine started at a time when I was still young, naive, and desperate for a spiritual compass to check and discipline myself into a better spiritual state. As much as I cross refer and spend a lot of time analyzing these verses, many of my posts are merely wannabe-exegesises that barely scrape the surface of God’s words, which will always be inexhaustible. If at some point reVer(sing) Verses had made sense to you, and blessed you, I thank God for that, but that was not my purpose of starting this blog, and hence God deserves all the credit. For those who are weeping and suffering right now, my heart goes out to you – I feel you, and let me end this study with a little prayer of petition for you – May your rejoicing come in the morning!